The election of new members to the Corner Canyon PTSA Executive Committee will take place on Tuesday, March 19, 2019 at 6:45 PM in the Corner Canyon High School Auditorium. 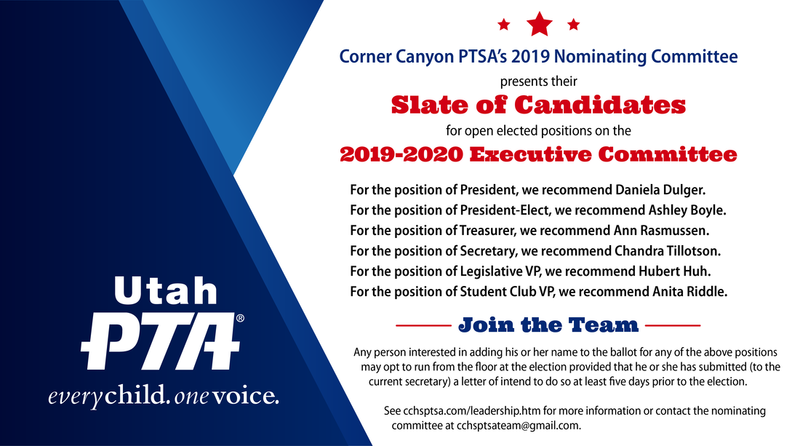 To add yourself as a candidate on this ballot, you must submit a letter of intent to the current Corner Canyon PTSA secretary. You may do so with a physical letter or by sending an email to cornercanyonptsa@gmail.com. This letter must be received at least 5 days prior to the election. Your name will then be placed in nomination. Those who have taken this step may then run from the floor at the election. Additional nominations for any or all of the positions may be made from the floor by (and only by) individuals who are members of this PTSA and have filed their intent to become nominees at least 5 days prior to the election. Their names will then be placed in nomination.